It is a very interesting question, I feel pretty sure that if the NEC thought their claim to the Masthead and Archives was watertight they would have driven this through a while ago. I hope we will get the chance to find out and the liquidator tests the matter properly for all of the creditors especially the staff. Oh well at least many of the people who were actively involved with Psychic News have pooled their resources at the Spirit of PN supported by many of the contributors. An interesting post by Geoff Griffiths from Roy Stemmans blog. "Oh what a tangled web we weave . . . At first they said they had to liquidate Psychic Press 95 Ltd because it was insolvent. This meant that they had to discontinue Psychic News. Then they suddenly say that PN can be stripped out of PP95 Ltd as it always belonged to the Union. If PN was really the SNU's properety all along, they could have subsidised it years ago, rather than leave it in a sinking ship. They could have put it in a safe place within the bosom of the Union, brought in some marketing nous to support the improvements brought about by Susan Farrow and taken PN on to greater things. As things have panned out, it really does look like they had an agenda all along. If not, what is the alternative explanation? One could be gross incompetence. As an SNU enthusiast, I am hoping that another explanation exists. But I am not holding my breath." Lets hope other SNU members have their eyes open like he does. Whatever occurred the previous liquidator, a very well credentialled firm specialising in this field, accepted our claim and allowed the debt and the appointed proxy. There is little time now SO ACT QUICKLY TO LODGE YOUR CLAIM. How on earth can subscribers not be creditors? They have paid for goods and have not received the full order. This surely means they are entitled to a refund - therefore they are creditors. What is going on here? Are the liquidators suggesting that all subscribers cannot claim to be creditors? Surely this is too close to the creditors' meeting for it to be legal? Shouldn't they have written to all subscribers who are due a refund? Does this latest information mean that they haven't contacted the subscribers? Ergo, does this mean that Monday's meeting will no longer take place. What a farce. What sleaze. Of course in normal terms subscribers who failed to get what they paid for would be creditors. Unfortunately, it appears that the SNU is trying to find a way to exclude such subscribers from the creditors list - perhaps by trying to claim that in the 'terms and conditions' they are able to exclude responsibility for not providing the goods purchased. I have personally been informed by the proposed liquidators that the issue of subscribers as creditors is under legal advice - though not told what that legal opinion is likely to be. Given it is now very close the the date of the Creditors Meeting and subscribers have not been informed I fear that we subscribers will be excluded from our presumed rights by default. 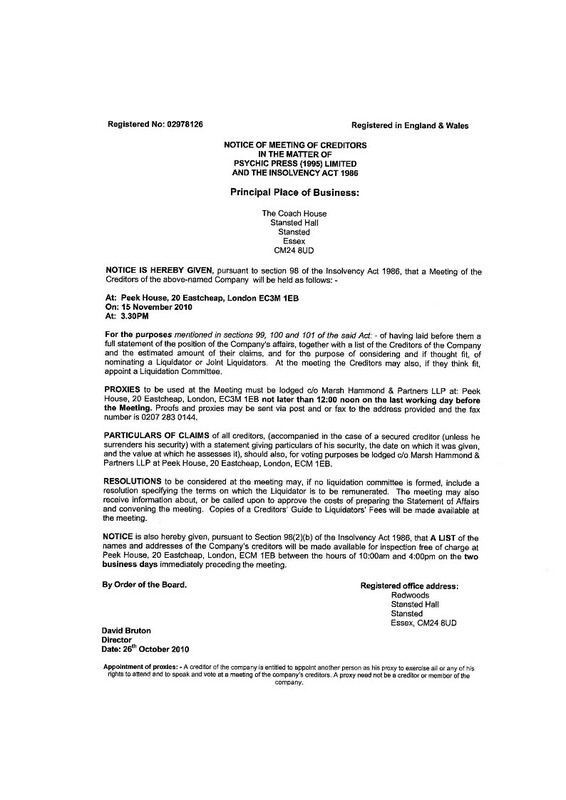 Not only has Psychic Press (1995) Ltd, the company that is being put into liquidation, not written to subscribers, it would seem that the SNU, the parent company, is also determined to exclude as many people as possible from the proceedings regardless of the legitimacy of their claim as creditors. I say this because I have become aware that there are other creditors, people and companies, that have legitimate claims for significant sums of outstanding debt owed by PP (1995) Ltd who have not been notified, or given an opportunity to lodge their claim, and/or appoint a proxy to represent them at the Creditors Meeting, despite being accepted as creditors with proxy rights by the previous proposed liquidator. The documentation proving their claims are available but it seems that the SNU which is certainly handling the whole affair have not passed on to the new proposed liquidators a list that includes those previously recognised creditors. One must ask why? Well one possible reason might be to reduce the apparent number of creditors (and their combined debt) so that the SNU can appear to be the major creditor thus ensuring they are appointed to the Committee of Inspection at the Creditor's Meeting. In other words, perhaps the SNU doesn't want anyone else, or any group of genuine creditors to have a say in what they want to achieve by this liquidation process. It would not surprise me if this is the case. The SNU have certainly done all in their power thus far to exclude, deny, and refuse, the rights of those who have been harmed by their action in closing Psychic News. Whatever may be the outcome of the Creditors Meeting on the 15th, it is clear that the reputation of the SNU has been seriously undermined by their actions in this matter. There are many people who have watched and have formed their opinion and I fear that the damage done by the current Executive of the SNU, and those who have been most directly involved in what has been done, may be much greater than the SNU may wish to admit. There is no doubt that around the world the actions of the SNU are viewed with shock, horror and disapproval. There are people who have been staunch supporters of the SNU that are turning away, resigning and making clear to all they can, why. "I wonder just how much this debacle is really costing the SNU, now they are paying two liquidators, sought other professional advice and are getting legal advice." Or one might say "I wonder how much SNU funding is being wasted....etc." Funds that should have done something useful....one despairs. Pound to a penny they'll scoot out unscathed. I will be interested to see how the SNU report all these financial expenditures in their Annual Report next year. Will they declare them, itemising every expenditure with a clear indication of why these costs were incurred or will they fudge the issue and 'hide' some (or many) of the costs under general headings which would make it impossible for any SNU member to establish exactly what had been spent on the disaster associated with the closure of Psychic News and the liquidation of Psychic Press (1995) Ltd.
Lis wrote: I will be interested to see how the SNU report all these financial expenditures in their Annual Report next year. Will they declare them, itemising every expenditure with a clear indication of why these costs were incurred or will they fudge the issue and 'hide' some (or many) of the costs under general headings which would make it impossible for any SNU member to establish exactly what had been spent on the disaster associated with the closure of Psychic News and the liquidation of Psychic Press (1995) Ltd.
in light of the behaviour thus far, one might expect that such honesty is pretty unlikely to be forthcoming.... Wouldn't auditors request missing details though? Or am I in cloud-cuckoo land? I don't like political wrangles,tend to stay out of them. But yes,Auditors should request all documents to be shown. From what I remember from my years in accounting,all such paper work going back to a certain date must be catalogued and produced. Yes political wrangles can be nasty but this goes well beyond any of that. Undoubtedly politics has played a part in what they did but the way they did it is just plain wrong. As a senior financial manager in the commercial world I am shocked at their actions, even stunned at the way they have failed to act according to the rules in insolvent situations. As a Spiritualist I am appalled at their lack of honesty, ethics, morality and of course Spirituality. As you may understand I just don't like what they have done, it really irks me. My feelings would have been different had they communicated with subscribers and Spiritualists the problems they faced. We know the level of support, including money, they were offered once the news leaked out. This support can also be seen in the very positive response to the new Spirit of PN. This would have given them time to try and restore the companies fortunes whilst ensuring they could properly deal with creditors and staff if teh efforts looked like failing. Then I would have respected their actions even if, subsequently, the independent PN was lost. It's like a lot of companies that go into liquidation,it is not announced until too late for any customers to retrieve their money. Same thing happened to us once but on a smaller scale. We spent over a £1000 once on washing machine,etc,little knowing the company was going broke. Unfortunately we paid by cheque instead on credit card,so couldnt claim full amount back. it still hurts now when ever I ever think about it. Why can't the SNU, do the decent thing, except that there plan to take controll did not work. They could just back down, give Psychic News over to J V Trust and The team of editors, then maybe they could all have a relaxing christmas. I wonder if the SNU have looked at the fact that any acusations that they have made against me will be held in Scottish Courts and not under UK court ruleing. as I have regiserd with Companys house Scotland. And it is comon knoledge, that this company is not a letterhead, with me. I think any spiritualist person would give the employees a thought, especialy when they must have been told by their legal advisor that they have not got a leg to stand on, Thats if they have any idea of what my company is going to do, and that is not enything to do with the paper that we are refering to. Please just stop this nonsence of, If I can't have it no one can, and let the people get on with their jobs, it is very clear what you were planing to do, and by doing any of these things it will not even come into the legal action SNU v McFadden, if my company is stopping the newspaper getting back out, please let me know, I can always find a new name for my company, but I will not back down to bullies or anyone trying to keep people out of a job, or stopping me with my company plans. At the end of the day, they will get it anyway and you know that. all this is acheiving is stalling and costing people there jobs, but at least it is fueling a great story line for people who want to purtray Spiritualists in a bad light, lets just hope that some of the SNU comitty can bring themselfs to think of the people they put out of work and the efects that has on them, but it is comming up to a Christ Mas.